Porsche is now taking orders for its plug-in hybrid Cayenne SUV with prices starting at £67,128. 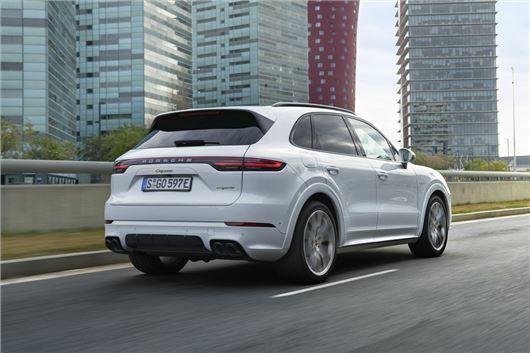 The Cayenne E-Hybrid combines a 3.0-litre petrol V6 engine with an electric motor to produce a combined output of 462PS and a hefty 700Nm of torque available from low down in the rev range. Acceleration to 62mph takes 5.0 seconds while it tops out at 157mph. When fully-charged, Porsche says the E-Hybrid can cover a distance of up to 27 miles under electric power alone, and reach a speed of 83mph before the engine kicks in. Under NEDC fuel economy tests, it returns 83.1 to 88.3mpg depending on the wheels fitted - although we know these figures don't reflect real-world MPG, especially for plug-in hybrid models. This makes the E-Hybrid the most efficient Cayenne currently on sale - and it's likely to be the most popular, at least until a diesel version follows in 2019. The German manufacturer made the bold move of temporarily removing all diesel variants from its line-up earlier this year in what it described as a reflection of the 'cultural shift' of its buyers. Drivers can charge the E-Hybrid in 7.8 hours using a standard 230V charger. This drops to 2.3 hours if an optional 7.2kW on-board charger is fitted. Charging can be managed remotely via the Porsche Connect App - which can also be used to operate the car's heating and air conditioning. The Cayenne E-Hybrid uses a boost system first introduced on the 918 hypercar. The electric motor can provide maximum torque as soon as you hit the accelerator, with all of the battery's energy used for boost when the car's in Sport or Sport Plus mode. Alongside the launch of the E-Hybrid, Porsche is now offering a number of new features across the Cayenne range. These include head-up display (a first for the brand), massage seats, a heated windscreen and 22-inch alloy wheels. Dealers are now taking orders for the Cayenne E-Hybrid with deliveries starting later this month.